Do I Have to Pay When an Employee Forgets to Clock In? One of the biggest frustrations employers face is getting employees to clock in and clock out at work. This isn’t unique to small companies with new time management policies, either. Large businesses spend hours each month training employees how to clock in and making adjustments when they forget to correctly account for their hours. This has lead some employers to ask: do I really have to pay these employees? If they don’t record their hours properly, how can I know that they are honest about their times they arrived and left? Regardless of how frustrating these mistakes are, you still have to pay your employees. Learn what the law says about employees who don’t clock in and what managers can do about it. What Are the Federal Recordkeeping Requirements? According to the Fair Labor Standards Act (FLSA), employers need to keep records on the number of hours each of their employees worked -- regardless of whether their employees clock in and clock out. This means that if your employee forgets to clock in and still works a full day, your payroll team has to adjust the schedule to account for the employee’s hours worked, and pay that team member accordingly. Oftentimes, employers ask if they can dock the pay of employees who fail to clock in or out -- or withhold pay entirely that day. They cannot. Employees must be paid for the exact number of hours they worked, regardless of whether or not they remembered to clock in. What Disciplinary Options Do Employers Have? If an employer can’t dock an employee’s pay for failing to clock in or out, they can take other measures to reinforce the importance of accurately measuring time worked. For example, a human resources representative can contact that employee’s manager to alert them to the time clock issue. In this case, the burden then falls on the manager to make sure that employee is clocking in and to talk to them if the problem persists. If you do plan to set up disciplinary measures for failing to clock in and out, make sure you write them in your employee handbook. Any changes to the policy or handbook should be reviewed with your staff so they understand the repercussions of not clocking in. Most companies that implement similar measures create a process with verbal and written warnings, followed by probation, and then termination for employees who won’t clock in if there are a certain number of violations over a set period of time. This shows that the employee exhibited a pattern of behavior where they refused to use the company time clock tools or disregarded comments from management on how to clock in, rather than punishing employees for the occasional human error that most people are prone to. While the main clock-in and clock-out process typically isn’t confusing for employees, there may be some confusion as to when employees should clock out for breaks -- and what HR can do if they don’t. Breaks apply to both 15-30 minute increments set out by the department of labor and 30-60 minute lunch breaks created by the company. When adjusting an employee’s schedule, it is illegal for an employer to dock time for breaks or lunch unless the employee actually took that time. If an employee says they worked from 8 am - 5 pm, an employer can’t record an hour-long lunch unless a manager verifies the break as well. While this law protects employees from not getting paid for work they did, it also protects employers. Employees can be disciplined for not taking their breaks or not taking them at the right time if it is clearly stated in the employee handbook. For example, if an employee works from 8 am - 4 pm and says they took their lunch break from 4 pm - 5 pm as an excuse to leave early. Employees also need to take their required breaks so the employer doesn’t have to pay unapproved overtime because workers decided to keep going when they needed to clock out and rest. Your human resources department needs to clearly explain the break policy with both employees and managers, and managers need to enforce employee breaks throughout the workday. This ways employees will be fairly paid, won’t be overworked, and commit time card fraud that hurts your company. It’s natural that there will always be a slight difference between the number of hours that an employee works and the time they clock in and out for. As an example, an employee might clock out, pack their belongings to go home, and then unexpectedly stop and help a co-worker for 15 minutes on their way out the door. However, this additional work time is insignificant, and it’s unlikely that the team member writes to HR and requests a payroll adjustment. To solve this, many companies implement policies where employee time tracking is rounded up or down to the nearest quarter hour. For example, if an employee clocking in a 7:55, the punch rounds up to 8:00. There is also a middle point where punch in at 8:07 round down to 8:00 while punch ins at 8:08 and beyond round up to 8:15. Depending on the time clock tool that you have, you can choose to tag the exact time or use this rounding method for easier payroll management. It’s okay for your time clock to be a few minutes off from what your employees actually work, but you need to adjust any major discrepancies so your records, payroll, and employee hours all line up accordingly. If you’re frustrated by employees who can’t clock in or out correctly and you human resources department hates fixing the timesheets each month, consider switching to a time clock tool that both parties can appreciate. OnTheClock is an online time clock, meaning employees can clock in or out wherever they have an internet connection. Brands can also geofence the app so team members can only clock in when they are on or near the premises. OnTheClock is also easy for HR teams who need to quickly make adjustments in a simple interface. You always have to pay employees for their time worked, but you can make it easier for them to clock in and help your HR team make changes with the best tool for the job. we are the employer... our problem is certain individuals keep forgetting to punch in/out, regardless of how many times we talk to them about this. what if we only paid for hours that were properly recorded? When the employee notices their paycheck is smaller than normal, we hope that this will sink in the importance of remembering to clocking in/out. Of course, we would catch up any remaining hours due to the employee on the next check. Is this method legal? reply from OTC - Hi Kim, Please note that we are not legal experts. With that being said, an employee must be paid their wages for the time in which they worked. It can be frustrating when employees don't punch in or out, and that is one of the biggest reasons businesses start using us. Our time clock system sends emails and/or text message reminders to employees to punch in and out (this includes breaks), so they would have absolutely no excuse if you were to try us out. Hi at work we have to clock in for 7.30. however due to different bus times we clock in at Round 6.50, then go get changed and wait for the brief to start. should we get paid for this? Also we do overtime every day as it's site times not contracted times, they let us clock out at 5.40 but pay to 6 or if we clock out at 5.39 we get docked 30 mins. Are they allowed to do this or do they have to pay us until the minute we clock out as it's overtime? reply from OTC - Hi Christopher, Each state varies when it comes to overtime rules, so we recommend looking into your state department for laws and regulations. However, it is required by law that an employer pays their employees for the time they have actually worked. We recommend discussing this with your HR department. I work for a big company, but they managers who run store, are going around saying that if we don’t clock on we don’t get paid instead addressing the situation with written warning and when I confronted them about it, they become defence and told me it was higher up that had told them to tell us that because they aren’t aloud to fix our time sheets manually? Was it wrong for who ever was higher up to tell their employees to tell their employees if they don’t do this they won’t get paid? Or am I in the wrong for stating that they have to pay regardless of they forget/don’t clock in and they shouldn’t be announcing out like that? And isn’t it also up to the employer to be making sure employees are clocking in and out properly I know it’s a pain when you have to do so but that is part of their job “managing” right? reply from OTC - Hi Chloe, Thank you for commenting. It is the law in the U.S. that employers have to pay their employees for hours that are worked, even if they forget to punch in or out. Employer claims a problem with time clock ( if employee clocks in 15 minutes early than schedule the system "kicks the employee out" and rounds up to the closet hour) leaving me to have to tell a supervisor every time and they don't plan on fixing the system. reply from OTC - Hi Jarred, Assuming you are using our time clock system, it sounds like the Admin on the account has punch rounding turned on. Please contact us for further assistance. my company is telling us if we miss turning in a timesheet they will pull from our accrued PTO for payroll. Is that legal? reply from OTC - Hello Kim, Very interesting questions and situation. We are not sure if this is legal or not since each state proposes its own regulations. Please contact your State Department and they will provide you with the legality of your question. Our company policy is to punch in and out each shift, but if an employee has a problem punching in, they can sign in/out in our "No Punch Book" but they don't even do that at times. My question is, if they do not do either, once payroll is started and they are short those hours, are we able to not pay them that day until the next pay period? reply from OTC - For an ethical standpoint, we would recommend paying the employee for the hours worked for the pay period in which the hours are performed. We strongly recommend having your payroll provider look into the legal side to see what your state mandates. Our recommendation is only personal and not legal advice. What if an employee wasn't just forgetting to clock in, but actively refusing to? What if I walked him through how to do it, gave multiple reminders, multiple warnings, but he just refused to do it until he was terminated without his hours ever going on the clock due to his own fault? reply from OTC - Hello Caroline, No matter if the employee chose to clock in/out or not, by law he is still entitled to be paid for the total hours that he worked. My employee has not paid me for several days of work over a 6 week period. It due to me forgetting to clock in or out but there are 45 other employees and over half fail to follow that rule. Do they have to pay me? I have proff I was at work. reply from OTC - Hi Felicia, The law does require that an employer must pay an employee for total hours worked. Our advice is to follow up with the HR department to sort it out. reply from OTC - This is a bit of grey area, while technically not working, they employer may not be obliged to pay. However, it would not be your fault that you cannot work, you showed up to work and due to the employers fault you could not actually work. Any good employer should pay for this time, in our opinion. 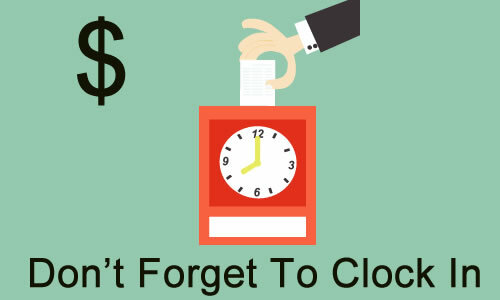 Can your employer take away your PTO for missing a time clock punch/error? reply from OTC - Hi Stephanie, PTO is generally regarded as a benefit and is part of your employment contract. The DOL dictates that ALL worked hours have to be paid regardless of time clock malfunctions or missed punches. The DOL does not specifically address employers taking away owed PTO hours due to time clock issues. However, if this was in your employment contract you have justification to ask for your hours back. We hope this helps! reply from OTC - Kim, Thanks for your comment. As we understand it, according to the DOL, all time has to be recorded and maintained. So if the time clock is not accessible, we suggest that the employer must manually record time and have the employee sign off.